Ruud Muis is founder and chairman of Foundation Pygmy Kleinood. He met the Pygmies for the first time in formal Zaire in 1989 during a long journey through Central Africa. He was touched by their distinctive way of life and concerned about their vulnerability. Ruud decided to do everything in his power to help them uphold their traditions and to develop their own independence. The name Kleinood is a Dutch quibble (it can’t be translated), created by his Africa friend Gerard Groot. Kleinood means: “small and precious people in need of help”. In 1989 the foundation was legalised through a notarial deed. Since then Ruud has returned over twenty times, often together with colleague foundation members Hugo Verhoeff, Martijn de Nooijer and Eva Cortie, to set up a variety of helpful projects together with the Pygmies. 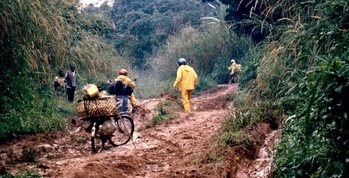 Travelling by off-road motorcycle, working their way through deep muddy potholes, sometimes having to walk for days on end through dense forests, together with porters and nurses, in order to reach the isolated Pygmies who need our help so urgently. The continual collaboration and unrestrained effort of Congolese friends and employers was and is indispensable; we name: Achille, Makuru, Bassara, Papa Kisangani, Ezabo, U'para, Dr. Lusi and Dr. Ahuka, staff and employers CME Nyankunde, Karl Ruf, and many, many more. 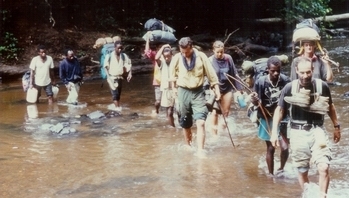 The Pygmies live in the Ituri tropical rainforest situated in the northeast of the Democratic Republic of the Congo: formerly Zaire and until 1960 the Belgian Congo.